What happens when you combine the delicate nature of French cuisine with the robust, meaty food of Germany? Well, to me at least, you get the best of both worlds. Originating from the Alsace-Lorraine region of France bordering Germany, this unique combination brings a bit more meat to the table, literally. 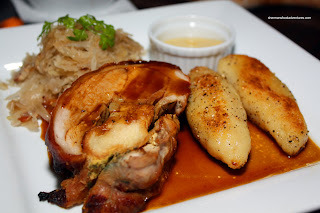 La Brasserie offers a slice of Franco-German food in a quaint and cozy restaurant in the West End. Much like the name implies, there are wines, beers and comfort foods associated with brasseries. Tonight, Darina (Gratinee) set up a dinner with myself and Kim early on a Tuesday evening. They do not take reservations here and it is imperative you arrive early to ensure a seat. While we were deciding what to order, Mijune (Follow Me Foodie) walks by along Davie. I would hazard a guess that she was on the way to eat something... Anyways, we put in our order and we started to set up our cameras with respective Speedlites. It's quite dark in La Brasserie, so a flash was necessary for good pictures. Kim softly predicted that it would only be a matter of time that someone would say something about the flashes... And our mad picture taking began with the br ead which was accompanied by butter and a pork/chicken rillette. I did like the texture of the rillette. It was soft while still maintaining a meat texture. However, I would've preferred if it was more aggressively seasoned. Arriving as a fairly generous portion, Kim started with the Steak Tartare. Visually, there were bits of onion and chives mixed in with the beef and egg yolk. Tastewise, it was quite mild. Maybe a bit too mild. 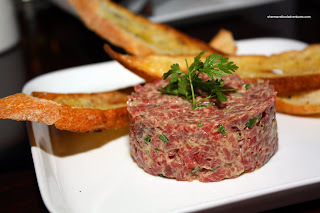 Of course, it's never a good idea to upstage the star of the dish, which would be the beef; but a just a bit more seasoning would have elevated the im pact of the tartare. 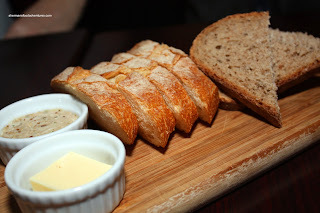 Texturally, I thought it was buttery soft and delight to eat, especially with the very crunchy toasted baguette. For my starter, I chose the Poutine (which is more Belgian than anything; but whatever, I like it). Darina and I thought the cheese some "squeak" (but now have found out that in fact, they were not cheese curds thanks to Mijune). However, the rest of the poutine was a bit of a disappointment. The gravy was well-seasoned and peppery; however there was just too much of it! It overwhelmed the frites, making them quite soggy and thus hiding any truffle taste. Kim suggested we try the poutine at La Belle Patate. And you know I will! For Kim's main, he chose one of the 2 dishes I was eying on the menu. In fact, we both were eying the same 2 items! Coincidence? So he ended up with the Braised Lamb Cheeks and for myself, the Suckling Pig. 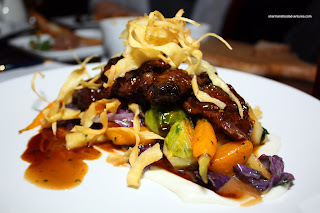 Probably the most visually appealing dish of the night, a good amount of lamb cheeks were topped with fried egg noodles resting atop colourful carrots, brussel sprouts and radicchio. I really enjoyed the gelatinous texture of the lamb and the luxuriousness of the rosemary jus. Kim mentioned that for some people, it would probably be too gamy; however we both like that strong flavour. The best part of any pig is the fat and the sucking pig had some pretty crispy skin - a good thing. However, I thought that that meat could've been a bit more moist, after all it is suckling pig. The sauerkraut was a nice tart (it was very tart, but I liked it) counterbalance to the rest of the dish. The schupfnudel was a bit too doughy for my liking. Darina opted for the Mussels & Frites in a saffron, white wine and garlic sauce. At this point, we were asked to ease up on the flash. I totally understand this and we did stop (until after I took one more snapshot of the mussels). 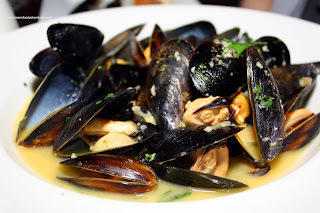 The mussels were plump and fresh while the sauce was aromatic and lightly flavourful. Interestingly, the frites were excellent being crispy and lightly potatoey. It was good that we got to try it without the gravy since the ones in my poutine did not hold up well to the moisture. Overall, Darina and I thought the meal was quite pleasant. We agreed that we'd give it another try. For once recently, Kim and I didn't agree. He was not overly impressed (while not disappointed either) with the entire meal and didn't see what the big deal is. I can see that. I was a bit on the fence as well; but ultimately, I thought it was decent enough at fairly reasonable prices for another visit. Hehe... Thanks Kim, changed it the post! Thanks again Darina!!! My post will be up later tonight. I'm still working on it. I think you guyes ned to check out Les Faux Bourgeois with me now; I think you'll be more pleased. Hi Darina! Yup, I've already been to Les Faux and I found it a fabulous value. 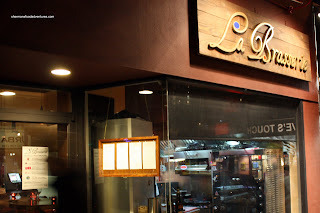 Good food for prices lower than La Brasserie. However, my personal favs are Salade de Fruits and Mistral. mmm, those mussles are making me awfully hungry. i love mussles but i find they never give you enough. maybe i'm a bit piggish but those shells take up so much space yet offer such a small (sometimes) reward. i need to find a place that sets a bucket of mussles down in front of me! and schupfnudel... that's a new one for me. looks tasty. Trisha, I love mussels as well. If you want a large pot of these for a reasonable price, I suggest Salade de Fruits. Their large order is very big and only $15! You should try the duck confit next time you visit La Brasserie. I love their duck confit. It was very tender, and I think the sauce had a perfect balance of flavours (in my opinion). hey, thanks for the recommendation... i'll have to check it out! 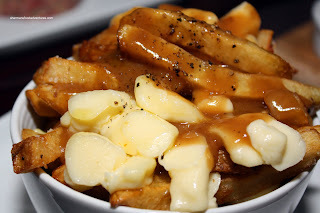 Your Poutine looks more appetizing, less soggy and messy than the one at La Belle Patate. Golly theirs was sitting in a cheap aluminum plate LOL. I shall gladly order their duck confit again. Thanks for the tip! I'm gonna give it a try and do a comparison!